Three people are facing charges following an armed carjacking. RIVIERA BEACH, Fla. -- Three people are facing charges following an armed carjacking. On Friday, February 8, 2019, a Riviera Beach police officer was patrolling in the 1700 block of Avenue L when the city tag reader alerted that a vehicle which was stolen in an armed carjacking the day before had entered Riviera Beach. Officers soon spotted the suspect vehicle and attempted to catch up to it. The suspect vehicle ran the red light at Blue Heron Boulevard and President Barrack Obama Highway. The pursuit continued northbound up President Barrack Obama Highway into Lake Park at speeds of approximately 80 mph. Once the vehicle came to a stop at 555 Bayberry Drive, 4 people exited. 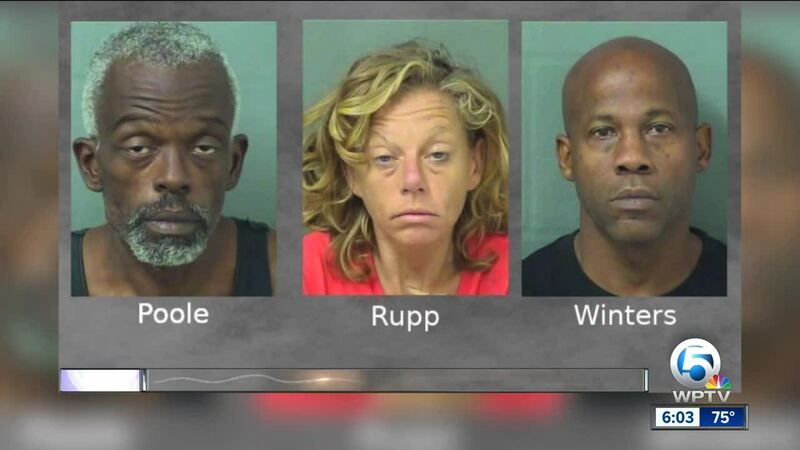 The driver of the vehicle, identified as Jamal Poole, the back seat passenger identified as Ernest L. Winters, and the front seat passenger identified as Amanda Faye Rupp were apprehended. A fourth person, an unknown white male, was last seen running northbound on 6th Street and is still at large. All three suspects that were apprehended were charged with trespassing in a conveyance for being passengers in the vehicle. Pool was also charged with fleeing to elude and grand theft auto. Police say the three individuals also match the description of the original three suspects that committed the carjacking early Thursday morning. The carjacking victim came to the police station where he was presented with a photo array and was able to positively identify all the subjects as the three suspects who originally stole his vehicle from him at knife point. Based on the investigation and the positive identification by the victim, all three suspects are also being charged with robbery with a deadly weapon.